If you can’t see the player above, click here to listen to the episode. If you are listening to this new mini series on how to make your first docuseries or documentary, you’ve probably got an idea but not sure where to take it next. You need a concrete plan with a reasonable budget. To do that, you need something down on paper and a high level plan first. But how do you go from an idea in your own head, to something other people can understand and contribute to on paper? You’ve arrived at the right place, and this is the episode for you to debunk the process to go from idea to a proposal on paper. This document can be refined and use for grant submissions in the future as well. The #1 trick to go through this exercise is to create a very rough draft quickly. Meaning, you’ll type quickly! Do not judge whether you are right or wrong, or if your answers are grammatically correct, or the feasibility of your idea (in terms of budget or execution). It’s simply too early to determine that. Your instinct at this stage is crucial. Put your cell phone away, turn off all notifications, and set a timer for 30-45 mins, type type type. The state you are in is also important. Be proud of yourself and imagine you in the zone of genius. Remember that nobody is watching, so nobody is judging you. If you don’t have time to go through this exercise at the moment, it’s OK and please keep reading. I’ll remind you at the end of to block your calendar for 30-45 mins within the next week to complete the exercise. Please note: From this point on, we’ll use documentary/docuseries together. Docuseries is a documentary series, often with 4 or more short episodes between 10-25 mins each. What is your documentary/docuseries for? In a few sentences, summarize what it’s for. Who is it for? Think about the people you want to watch the documentary/docuseries. Who are they? What do they look like? Why are the stories you are about to create important to them? What is the feeling you hope to leave them with? You may have heard of a popular approach for this type of work called painting the “audience of one”, or the “ideal customer avatar”. Essentially the intent of this exercise is to find that perfect audience member. Later on you can drive all your effort, ad dollars to engage with people who’s just like your perfect audience member. In other words, who is that one person who’d LOVE to see the documentary/docuseries? Personally I’ve struggled with the approach to find a single avatar, or a single audience member. It sounds easy and simple but the reality when going through this exercise is just the opposite. The truth is that there may be one clear cohort of people who may resonate with your documentary/docuseries, but there may also be more than one groups of people that share very little in common. If you are like me, don’t limit yourself, feel free to include a few avatars / audience groups. You will always have the option to narrow that down later. Remember: You are just starting out and the artistic and content direction of your project may change or shift. Why? You are doing the work and you want to do the work - but why? Is this a personal fulfillment, or perhaps this is an initiative that goes above and beyond yourself, your story? Also you should think about why you are uniquely qualified to do this work. As for Feisworld, our docuseries and many of the stories we discuss are related to immigrants’ journey moving to, living and thriving in America. Because I have experimented at least part of the journey firsthand, and I have a podcast (i.e. the platform) with many people who are qualified and willing to discuss their own journey. Therefore I felt a strong desire and responsibility to not only share my stories, but others’ as well. When: When do you think you’d like to start and continue working on the documentary/docuseries project? For Feisworld, it was important for me to set a high level timeline, as well as (realistically and conservatively) how long we need in terms of production time. We started talking about the docuseries in February 2018, workshopped in June, production in September/October and post production will begin in late October through end of 2018. Where: Think about where you’d potentially like to shoot the docuseries. If no specific locations have been identified, think in terms the types of places where you’d like to film that would be appropriate for your stories. For example, shooting at someone’s home vs. an office, rented space, or outdoors. 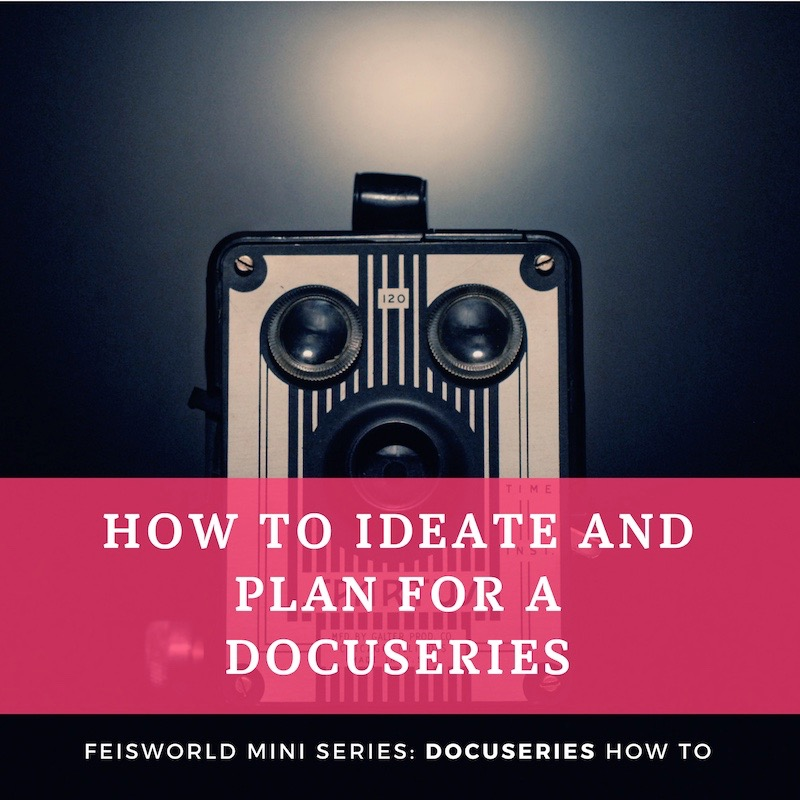 For Feisworld, we also had to consider different cities because we have an interview-based docuseries and guests were to be determined during our planning process. We had offered our guests to travel to us (which can save production cost significantly). However, it’s not always guaranteed that travel will work for the guests. In some cases, you’ll need to travel to your guests.